Good: Slick base card design that has a mirror image of the featured wrestler on the other half of the card. Nice inclusion of different types of subset cards, such as Ultimate Sunday, Fast Traxx, Be My Valentine, Steiner's World, and Lending a Hand. New TNA foil cards give the base cards an improved edge. Guarantee of one multi-autograph card in every box. Amazing look and design for the Event-Used Ring Mat Autographs. Bad: Autographs are just the base cards with a signed sticker on it. A separate design and on-card signatures would be nice. Base card backs lack important information such as world title reigns, when they debuted in TNA, famous feuds, etc. The parallel cards are hard to spot since the only difference is an Impact Wrestling arch on the front of the card above the wrestler's name. I had to go through the box twice thinking I was shorted. Unlike the past few TNA product releases, we didn't get a full 2012 TriStar TNA Impact Reflexxions base set in this box but got multiple duplicates. The Bottom Line: 2012 TriStar TNA Impact Wrestling Reflexxions is a mid-level wrestling product that costs around $75 per box. For each box, you are guaranteed three autographs (with one multi-autograph), one ring mat autograph or memorabilia card, one foil card, and two parallels. This product gives collectors a chance to pull some amazing hits such as autographs of Hulk Hogan, Ric Flair, Sting, Kurt Angle, and many more. Wrestling fans should have a blast busting this product. With each new TNA set, TriStar is getting better with their base card design. I like the photography and mirror-imaged shots used on the glossy base cards. 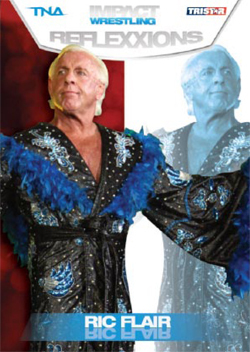 The card backs lack biographies and important wrestling information, though. Wrestling fans will definitely enjoy some of the subsets, like Ultimate Sunday and Be My Valentine. The parallel cards are hard to distinguish from the regular base cards, but the foil cards look amazing. Autographs, unfortunately, rely on stickers again but the look and design for the Event-Used Ring Mat Autographs is fantastic. The 2012 TriStar TNA Impact Reflexxions checklist has 99 cards in the base set including 38 subset cards. Unlike past TNA products, this release has the fewest number of different wrestlers showcased. Because of the subset cards, there can be up to five different cards of certain superstars. There are a few TNA debut cards of several wrestlers that recently joined TNA but none of them are high-profile names. TNA also released several established and well-known wrestlers in 2011, which makes Reflexxions a little dated. Each hobby box has 20 packs with six cards per pack, which is significantly down from the number of cards for the last TriStar TNA release. For each box, you are guaranteed three autographs (with one multi-autograph), either a ring mat autograph or a memorabilia card, one foil, and two parallel cards. That's not bad for an affordable mid-range release. The main selling points of 2012 TriStar TNA Impact Reflexxions are the hits. If you are lucky enough to pull a quad autograph or mat autographs, they should pay for the box itself. The best two cards we pulled were an Abyss/AJ Styles/Christopher Daniels/Matt Morgan Quad Memorabilia card and a Hulk Hogan foil card. There are enough nice-looking designs in 2012 TriStar TNA Impact Reflexxions to appeal to various wrestling collectors, such as the Ultimate Sunday and Be My Valentine subsets. Whenever I open a box of cards, the excitement is always there as I anticipate if the pack in my hand is the one with the hit in it. I think most collectors will feel the same way when they search for the pack that has the multi-autograph card. Each of TriStar's TNA wrestling sets have been heavy on the autographs. 2012 TriStar TNA Impact Reflexxions promises the most yet. Boxes yield at least three autograph cards numbered to 99 or less, one of which is a multi-signature card. 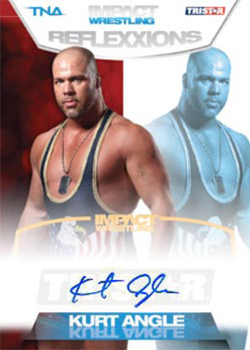 2012 TriStar TNA Impact Reflexxions has signatures from TNA's top stars like Hulk Hogan, Sting and Kurt Angle. The set also has the first TNA signatures of Eric Bischoff. Other box hits include a memorabilia card, two parallels and one premium foil card. Every box of 2012 TriStar TNA Impact Reflexxions has three autographs numbered to 99 or less. One is guaranteed to be a Reflexxions Foil Autograph with either two, three, four or six signatures. 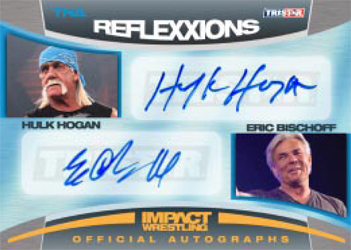 Reflexxions hass more than 50 signers, including the first TNA autographs of Eric Bischoff. All autographs numbered to 99, 50, 25, 5 or 1. For the first time, TriStar is producing Autographed Event-Used Ring Mat Cards. Numbered to 50 or less, signers include Sting, Kurt Angle, Jeff Hardy, Gail Kim, Rob Van Dam and Velvet Sky. Memorabilia Cards are numbered to 199 or less. Variations include autographs and multi-swatch cards featuring up to four different personalities. Jeff Hardy Art Cards randomly inserted. One Relfexxions Foil Card numbered to 40 or less inserted in every box. Base set subsets: Steiner's World, Be My Valentine, Fast Traxx, Ultimate Sunday, Lending a Hand. Two base set parallels numbered to 40 or less in each box. Print run limited to 100 24-box cases. Each box numbered out of 2400.